Today I started rebuilding the right "wing". 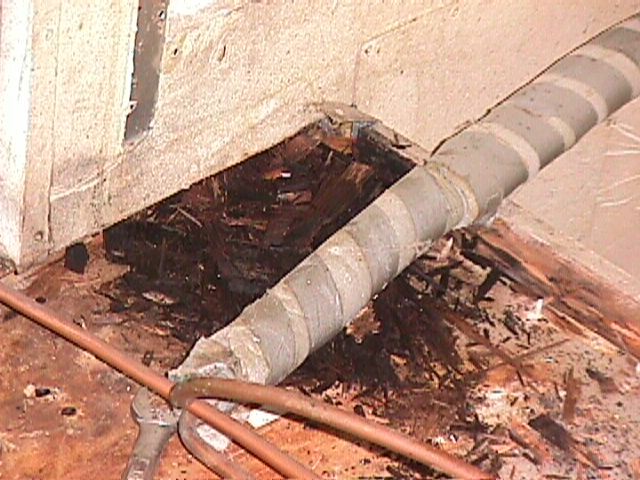 After I got the toilet enclosure out, I found more rot. I cleaned that out, then started cutting the new pieces to fit in to replace it. I'm sure that when the Cayo family built this thing, they just picked up a pre-built laminated part and stuck it in. I don't have that luxury, so I'm figuring out each piece as I go. 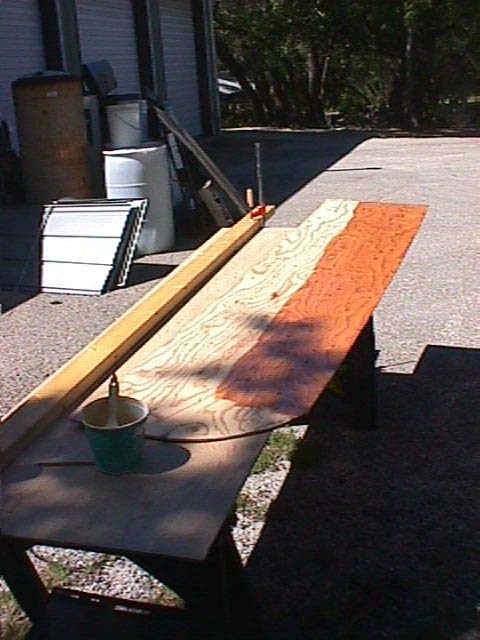 In addition, I'm coating the parts that are the most likely to get wet if it leaks, with a resin. I now have about half of the first one built. Of course, you're probably thinking, I need to worry about why all this rot happened. It was obvious that something had leaked badly, and for a long time. When I put the air conditioner on the roof, I found out what leaked. I noticed what appeared to be a bunch of missing rivits. I didn't have time to do much except put the unit on the roof and bolt it down, but I knew I had to get rivits and fix it. I talked to Chuck Cayo about a bunch of things, and when I mentioned that I needed to replace some rivits in the roof, he told me what to do. First, he told me that my plan of removing the inner liner to use normal rivits that have to be hit on both sides wasn't going to work. 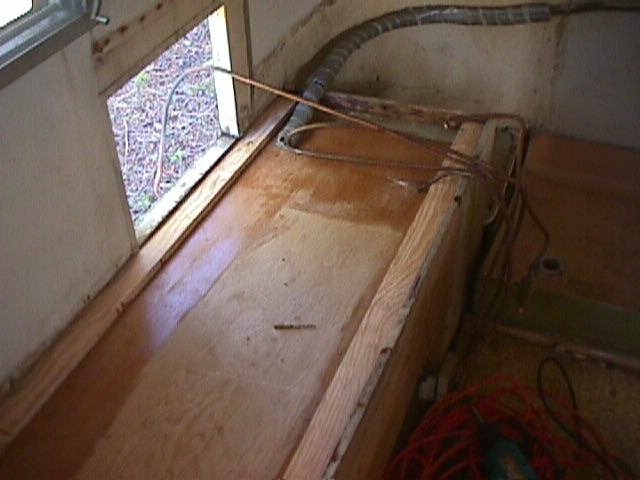 The problem was that when they built them, the finished the outside, put in all the wiring, then filled the entire cavity with foam insulation. It would make my plan much more difficult. Second, the solution was to get rivits called "closed end" pop rivits, which do not have a hole all the way through. Normal pop rivits would leak, but these had no holes all the way through. They look similar to a normal pop rivit, but have the inner end sealed. I didn't even know they made them. I bought my rivits from Fastenall. You can find them on the web, although any good fastener supply should be able to get them. There are many manufacturers who make them. Then, While wating for my resin to cure, I climbed up on the roof. What I found, upon closer inspection, was that at some time long ago someone had mounted some sort of rack, drilling about 40 holes and screwing down the rack. That wouldn't have been too big a problem, but later they removed the rack and just left the holes. About 40 holes every time it rained. No wonder everything rotted! Now I need to get some roof sealer. I don't think the rivits will leak, since I put a bit of sealer on each as I installed them, but I worry that the holes in them will trap water and over time, freezing and thawing will cause them to swell and break. It's not done by a long shot, but I got my water tank ordered today. I'm stuffing a 40 gallon rectangular tank where the original presure tank was located. 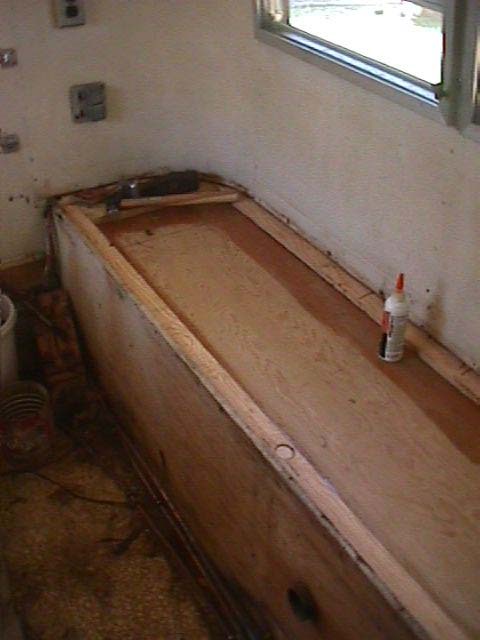 It'll take a new wood enclosure, but the added water capacity puts it right in line with the new high dollar truck campers. For anyone who is interested, I ordered tank #B241 from Ronco Plastics out of their Marine Tank Catalog. Got the water heater ordered also, $239 delivered to my door. I also ordered a new range, a Wedgewood 17" model, black top, black front, with piazo lighting. Soon this thing will look livable! The kitchen counters are coming out in the morning and the left side will begin it's restoration.